Might as well have a dedicated thread for it given it's going to be a long term/ongoing discussion. Great to see that some good architectural design now comes into play for railway stations - the new design looks great. And the functionality of the new bus bays alone makes it a worthwhile upgrade. Certainly hope this sets a precedent for the future. The start government really needs to set a target in eliminating a certain amount every year - we have waited way to long to address this issue. The fact that they are serious hindrances to trains and traffic is secondary really to the fact that many are death traps. I also hope they follow the order outlined in the priority list. The fact that somewhere like New Street in Brighton (rank 223!!!) is being done before somewhere like Main Rd/Furlong Rd St Albans (ranks 4 and 5), where many people have died, is disgraceful. What does everyone think - is the list a true reflection of priority? Or are there others that need to be bumped up the list? Mitcham looks great, but there doesn't appear to be any reservation or room for a future triplication of the line to Ringwood, which Whitehorse and Maroondah Councils are advocating for and the DoT and PTV are considering. Even if such triplication is a decade off, it is silly to leave no room and have to partly demolish the station in the near future. I'd prefer them not to - all triplification does is add more congestion - think about it... two tracks going one way, one the other way.... 54-60 TPH in one direction (max capacity) and 30 TPH in the other direction - all you get is congestion at either end. A topical one for this thread. Hope this at least provides some impetus for further upgrades in the near future. Major delays are expected on the Frankston train line and on the Nepean Highway after a truck and a passenger train collided at a level crossing in Melbourne's south-east. The truck driver escaped with only minor injuries after his truck crashed into a train at Bonbeach railway station. The truck and the train collided at the station's level crossing just before 6.30am on Friday. 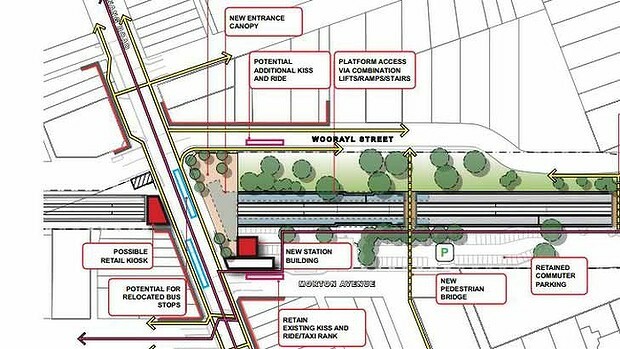 The whole franga line from Moordialloc to Seaford itself would be a nightmare case for grade separations - rail line is hemmed by Nepean Highway on one side and another (multi-named) road on the other, closeness to the beach, I'm guessing there'd be a lot of track elevation rather than sinking? Would offer great sea views! An elevated rail line may actually be the most wise way to build this. Certainly won't be cheap, but if it covers a fair distance of area that has challenges with achieving level crossing removal, this would likely be cheaper than any tunneling. Re triplication, it can be useful for express services to/from the city for those who live in the outer suburbs and don't want a long, overcrowded journey. It can also be good for getting trains that have reached the end of the line quickly back to the city during peak period to again make the journey outwards, collecting more passengers and reducing pressure. Even if it's not in the pipeline anytime soon, it is worth leaving room for in the future. Re the Frankston line, elevated definitely seems the way to go. Will be expensive, but the overall benefits to both cars and trains will be phenomenal. Maybe the cost could be recouped through new land below the tracks? Maybe I'm being completely unreasonable, but if the rail was entirely elevated then surely you could fit one or two stories of shops/offices below the tracks. It's common practice for elevated rail overseas to travel over other buildings and properties. The train stations will be complex but definitely possible with some good planning. 1. The surrounding delay points on the road network that might drop a project down the list. Eg Bell Street on south morang where nearby intersections cause the real delays like st George's road, high street, plenty road. O Toorak rd where the freeway interchange controls delays. 3. Why would anything on the upfield or Alamein line with 3 tph be a high priority? 4. No inclusion of construction cost meaning no benefit cost ratio is possible. 7. It's dated anyway. Mitcham and rooks both had fatalities the years between this was documented and now. I'll cop out and say I'm up to 10 with those dandenong corridor doubles. I think after these you,d need good analysis to confirm the order things are needed... Eg. 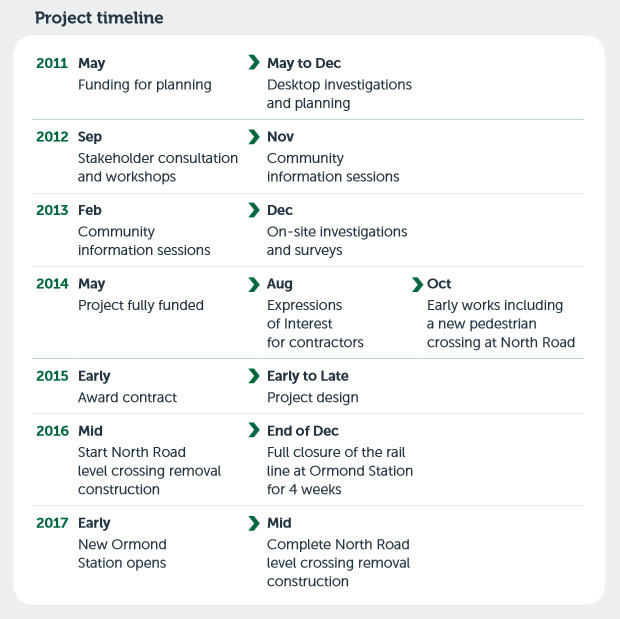 1.North road is a priority traffic route but does the level crossing actually create delays? 4. Could you do a series of outer suburban ones cheaper for the same total price as one inner one? 5. Ae any of the frankston line ones even really feasible to build? A low-cost Metro proposal to fix six level crossings along Melbourne's most congested railway line was rejected by the Napthine government for a more expensive plan to remove just four crossings, because VicRoads opposed the idea. But Melbourne's rail operator is continuing to push the government to fix more of Melbourne's 170 or so level crossings using its cheaper ''lite'' grade separation model, which it has costed at about $34 million per project. By comparison, the recently-announced Main Road level crossing removal in St Albans will cost a record $200 million. Leaked cabinet documents seen by Fairfax Media reveal that Metro put to the government a $466.8 million plan to fix six level crossings on the Dandenong line, as part of an unsolicited proposal to upgrade the Pakenham and Cranbourne lines. But Treasurer Michael O'Brien rejected the plan, and the government announced in March it would remove just four crossings on the line - at Koornang, Murrumbeena, Clayton and Centre roads - even though that will cost $44.8 million more than Metro's original proposal. Plans to fix busy level crossings at Heatherton Road and Corrigan Road in Noble Park were dropped from the proposal. it's a bit of a yeah but nah kind of situation. Can see something like this working in places like Hallam, Berwick (Clyde Road), Narre Warren (Webb St) and over in Bayswater, but for the inner city rail under road with development in the air space would be the most beneficial, despite the higher cost. 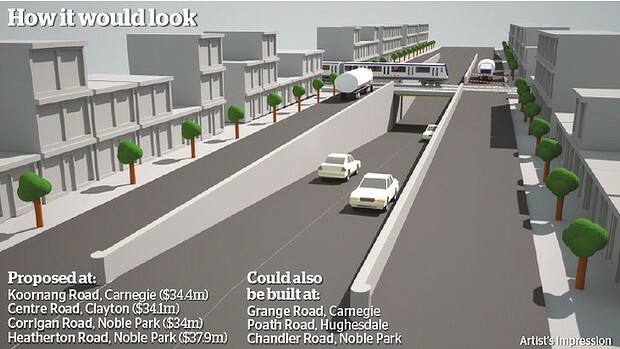 Here are the basic plans for Carnegie, Murrumbeena and Clayton. Rail under road, no sign of plans for quadruplication, but they are basic layout concepts art the moment, no plans for station access re- ramps or stairs at the moment. Three ageing suburban railway stations in Melbourne’s south-east will be demolished and replaced with new station buildings under concept plans released by the Napthine government on Wednesday. The plans involve rebuilding the stations at Carnegie, Murrumbeena and Clayton, which would be put partially underground as the Dandenong railway corridor is sunk and four busy level crossings removed. Crossings at Murrumbeena Road - consistently rated one of Melbourne’s worst in RACV’s congestion surveys - Neerim [Correction, Koornang] Road in Carnegie and Clayton and Centre roads in Clayton are to be removed as part of a $2 billion to $2.5 billion upgrade of the Cranbourne-Pakenham rail line. The project, due to start next year and be completed in 2019, will force the closure of Melbourne’s busiest rail corridor for an estimated six weeks as level crossings are grade separated and stations rebuilt. The removal of the Murrumbeena Road level crossing alone is predicted in project plans to require the Dandenong line’s closure for about five weeks. Older images don't show the large number of apartments going up directly south of the station. LOL at consolidating 3 tram stops into one! WTF! I doubt if you'll find a single regular tram user in that area happy with that! "Consolidating the three nearby tram stops into one island-type stop opposite the new station entrance"
These stops are so close together that not even the public would complain about their removal. One stop is literally around the corner from the other which is less than a minute walk. I am not a regular user of this line but when I do catch the tram I can see the stop removals will make a significant difference to travel times between Camberwell and Chapel St as well as the fact that the level crossing is removed. ^^ Yes, I keep hearing about possible time travel improvements when tram stops are removed and Yarra Trams really believe this and probably do it to help avoid paying fines most of the time. Two questionable examples are the removal of both the Lonsdale and Franklin Street stops along Elizabeth Street. These stops were intuitive and at intersections with traffic lights, so the tram is still stopping at these intersections 50% of the time and now passengers can no longer get off, great service improvement for tram users, I don't think so! Worse still is when they locate superstops in between intersections (Collins Street line between Russell and Exhibition Streets), you end up with the absurd situation where trams often have to stop 3 times between intersections instead of just twice! I don't know the area too well however the travel time improvements can only be significant if those stop removals are integrated with 'genuine' traffic light priority. There is no point removing a stop if the tram has to wait at traffic lights especially where the cross traffic is light. Without priority the situation can be made worse not only by the fact that you have sacrificed convenience but also made no gains in travel times as you mentioned with the example of Collins St. Additionally the placement of stops mid block is quite ridiculous however in the case of Glen Iris the placement near the station is IMO the most logical choice as it allow quick access to the station while at the same time is close to the corner of Malvern Rd and Burke Rd allowing reasonable access to people living near the corner. If tram stops are rationalised in the suburbs the first choice would be the ones that are mid block while the intersections stops are maintained or at the very least 3 mid block stops are rationalised into 2 for longer blocks and 2 stops rationalised into 1 for shorter ones. Of course this would only work if there was genuine traffic light priority that means a green signal (with turn) is switched on ahead of the traffic light, not when it comes to a stop at the intersection and also it should work each time the tram approaches the intersection not randomly as is the case today. From the premier's facebook page. no mention of priorities however. Lowering rail line under North Road, construction of a new station, concourse & platforms on North Road with stairs and ramps. EE Gunn reserve be to used for spoil and site offices, reduces construction vehicles using local streets with direct access to train line form oval. No reduction of existing car parking, new bike/footpath to connect with others along the train line to Caulfield. Underpass at Dorothy Ave to be removed as car access due to grade of track, possibly retained for bikes and pedestrians. No road extension at Walsh Street which was considered, local complaint listed as reason. No more vehicle crossings between Glenhuntly and North Roads. At least they had a few crossing projects ready to go thanks to the previous govt. It gives some momentum. A long way to go yet though to get to the 40 or so they promise to remove. 20 this term and 30 second term. Of the 20 one would assume the first ~10 are those under development during liberal years. First 3 are most advanced. I'm guessin thompsons road will be in the first term as they have promised full duplication form Eastlink to South Gippsland highway which includes the level crossing. That would leave 9 up for grabs... I'd group a couple more of the dandenong corridor ones (eg grange and poath done at same time as koornang and Murrumbeena). Politically I expect they'll do a couple on the frankston line maybe Skye road and Edithvale foad (as the ones in between may benefit from grouping), leaving a few in the for the west and north (Buckley, Melton hwy, high at reservoir), and a few for the outer East maybe abbots road and maroondah hwy. saw the minister for public transport speak at an Engineers Australia function yesterday. I've heard that the some of 4 which are currently out to tender might get an additional LC added to them. - North Road + McKinnon + Centre Roads. All eyes will be on the State budget then. Likewise any mention of value capture plans.